A fabulous blend of select black and green teas with fruity, peach-like notes. A Black and Green Tea Blend is a unique new way to enjoy the nutritional benefits of Black tea plus the anti-oxidant properties of Green tea. Completion Tea from Praise Tea is a great green tea and black tea blend! I’m always interested in blends with more than one tea type base! 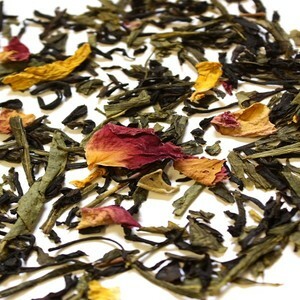 The fruity-peach and floral-rose type tastes meet in the middle as do the green tea and black tea tastes! Everything is pretty even taste-wise and nothing is too overpowering! Having said that…this IS a flavorful blend! I really enjoyed all of the flavors here! Well Done! I think that this one was one of my favorites from Praise Tea. I love how everything comes together.